Sometimes, a single instance of Takedown isn't enough to capture all the scoring activity. At tournaments, multiple wrestlers from the same team compete at the same time. Or, the varsity and junior varsity teams compete at different events on the same day. In both cases, scoring information would need to be manually transferred to one of the iPads running Takedown. There must be a better way! Release 1.4 to the Rescue! With this release, Takedown now offers a simple way to share data between multiple iPads. 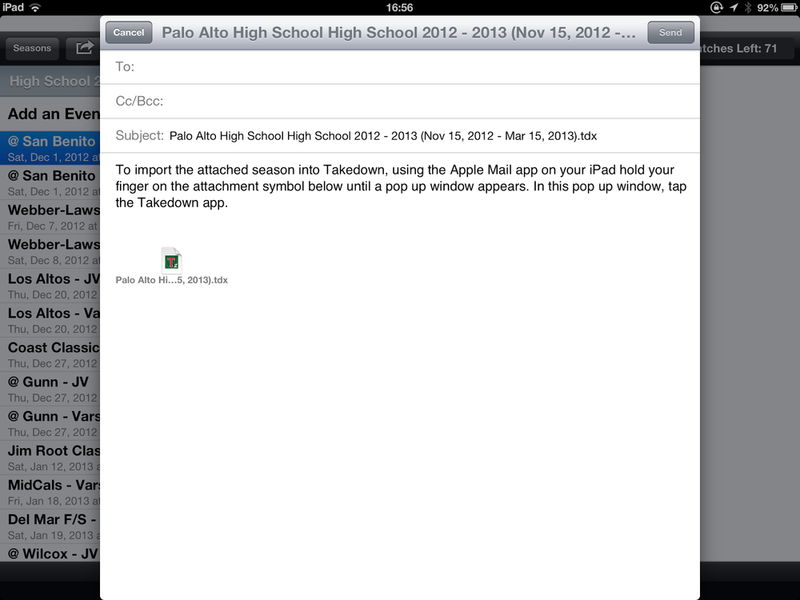 Data from an entire Season is exported from one Takedown instance to another using email and the iPad's "Open in..." capability. An exported Season contains a roster, schedule and all matches scored in that Season. Generally speaking, an imported Season fills in the blanks; that is, the Season you're importing will generally not overwrite existing information. But, if your database is "missing" information, then data from the imported Season will be used. The details are surprisingly complex and there are some exceptions. But, that's the gist of it. Enter the email addresses of the person(s) with whom you want to share the data and press "Send." Any of the labels with a ">" can be tapped for more information. If you're satisfied with the results, tap "Save." If you change your mind, tap cancel. You might find other uses for Takedown's data sharing feature. Unless the Season on your iPad and the Season you're importing have identical names and start/end dates, a new Season will be created. If you want to augment an existing Season with the imported data, make sure the names, start/end dates are identical.